OpenOffice Writer Recovery tool allows you to repair damaged ODT files and generate an instant preview of the same. It is possible to recover any ODT (Office document text files) created either by OpenOffice or Star Office word processing applications. ODT file recovery software performs recovery in three steps i.e. With the SysTools Open Office document recovery software, users can restore all of its contents. This will include: indexes, diagrams, characters, hyper links, text, text formatting, image objects, Unicode characters, tables, page orientations, header footers of the page, etc. Also, other formatting added in the Writer document will be retained as well. 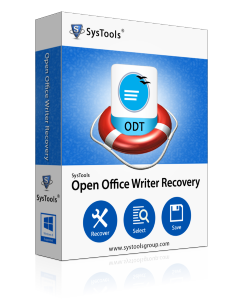 During the recovery of ODT files, OpenOffice Writer Recovery tool keeps the data intact. There will be no changes done to the original formatting of the document like hyper linking, images, bold, italic, etc. Software will recover all the pages within a single ODT file. Once you choose the appropriate option to export recovered ODT file, software prompts you to choose a saving location. It is possible to select any desirable location to save the file. Also, if you want; directly create a new folder from software panel and save the file into it. Yes, software is fully compatible with Windows 8 environment and also runs successfully on all its below versions. Can I repair my corrupt ODT file using this tool? Yes, you can recover corrupted ODT file and save it back either as ODT or RTF format. How many ODT files can I repair at once? You can repair one ODT file at a time using this software. However, there are no limitations on the number of ODT files that can be repaired. You can repair any number of ODT files back to back. Can I also recover ODP files with this software? No, software only repairs Open Office ODT files. Is it possible to assure successful software working before its purchase? I wanted to be aware of the working of this software. How shall I ensure myself of the successful working of this software? You can assure yourself of the software working by using its demo version. Demo version is available for free but has some limitations. If it works properly under your environment then the full version will also work similarly. When will I get software license once it is purchased? You will get full version license details via email, within 5-10 minutes of making purchase. Is there any ODT file size limitation for using this software? No, software will help you repair any size of ODT file without any technical troubles faced. Will software work for me in case of errors too? I was trying to access one of my ODT documents and was surfaced with an error message. The error read: "The file is corrupt and cannot be opened". Will the software work in this case too? Yes, software resolves all kinds of corruption issues successfully and repairs ODT files of Open Office even when errors are encountered. The fully licensed version of the software is available at an absolutely affordable price and allows the users to perform complete recovery of the database without implementing any restrictions as the users can not only recover and preview the recovered items but can also repair corrupt Writer files and save them without any restrictions. ODT files are not generally used by many users, hence it was a bit difficult for us to find a solution that could recover it. However, one of our company's clients suggested using Open Office Writer Recovery which was surprisingly the kind of solution we had been looking for. A huge thanks to the developers.